CNG: Printed Auction CNG 75. BOEOTIA, Federal Coinage. Circa 225-171 BC. AR Drachm (4.80 g, 1h). Sale: CNG 75, Lot: 195. Estimate $200. BOEOTIA, Federal Coinage. Circa 225-171 BC. AR Drachm (4.80 g, 1h). 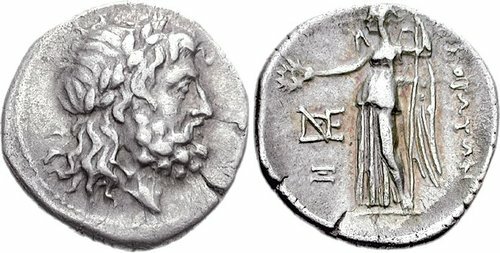 Laureate head of Poseidon right / Nike standing left, resting on trident and holding wreath; monogram to left. BCD Boiotia 135 (same rev. die). VF, light iridescent tone, small edge split.